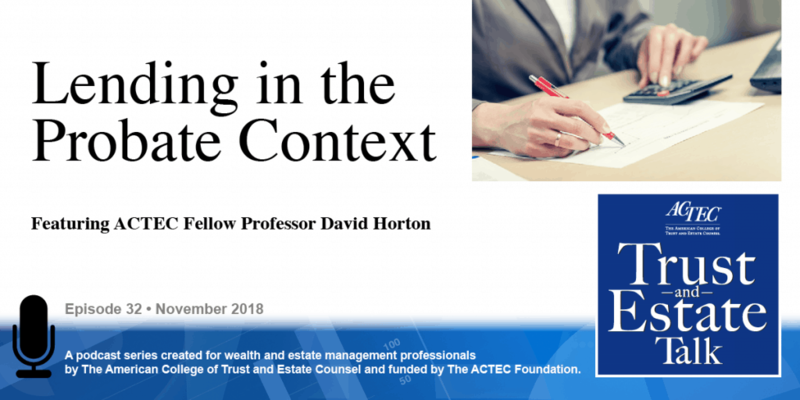 “Lending in the Probate Context,” that’s the subject of today’s ACTEC Trust and Estate Talk. This is Margaret Van Houten, ACTEC Fellow from Des Moines, Iowa. What is probate lending? To answer that question you will be hearing today from ACTEC Fellow Professor David Horton of Davis, California. Welcome David. So you might have heard of payday lenders where check cashing companies will offer to cash a check that’s postdated. So, you write a check that’s dated several weeks in the future when your next payday will come. The lender will give you the amount of money that’s on the check minus about $15 for every $100 that’s on the check, so they’ll take a small finance fee. You might have heard of pension lending, companies that buy your right to get a governmental pension. And you might have heard of tax refund anticipation loans. All of these companies share a couple of common threads, they try to get people to sell their right to a future income stream in exchange for an immediate cash payment. And although pension lenders, payday lenders, and tax refund anticipation lenders are heavily regulated and have been heavily studied probate lending has flown almost completely underneath the radar. So, I’ve actually written two law review articles on the topic, one is called “Probate Lending” that was published in the Yale Law Journal in 2016 and the other one is called “Borrowing in the Shadow of Death”, which was just published by the William and Mary Law Review. [Directions for free subscription to The Wills, Trust, & Estates Law eJournal-CMBO articles.] And what I did in these articles was I used a data set that I have assembled of about 2,100 estates that came on calendar in a major California county between the beginning of 2008 and the end of 2010. California has a unique law that requires these probate lenders to file their contracts with heirs and beneficiaries in the probate record. So I was actually able, based on my review of all these probate files, to see the contracts and to determine how much these heirs and beneficiaries received, how much the company received, and when the company was repaid. So I could calculate key statistics such as what the effective interest rate is on these loans. And what I found are two major findings. One, these probate lenders almost always get repaid. Out of the 291 loans that were in my data set, probate lenders recovered the full amount that they advanced, plus all of their interest rate 97.5% of the time. And that’s actually a key distinction for a lot of consumer protection regulation is whether an advance of money is contingently repayable or absolutely repayable. If an advance of money is only contingently repayable then statutes such as the Truth in Lending Act and State Usury Statutes, which cap a maximum interest rate that can be charged, do not apply. But if a loan, an advance of money is almost certain to be repaid then these consumer protection laws do apply. So I found strong support for the idea that this practice should fall under the auspices of the Truth in Lending Act and Usury Laws. In California the usury cap is 10% simple interest per year, so that’s the maximum amount the creditor can charge without violating the law. My review of these probate loans found one out of more than 285 where the effective interest rate was less than 10%. And in fact 101 of the loans in my sample had effective interest rates of 101% or more, so I believe that my articles show that companies are violating consumer protection law on a massive scale. Does a spendthrift cause in a will have anything to do with this is available in an estate or trust? That’s a terrific question, yes. So although there’s no legal authority on point. A spendthrift clause would be a really wise thing to insert into your will if you’re worried about a particular beneficiary that you’ve named trying to cash in on their inheritance early. I mean as, I think anyone listening to this knows, the purpose of spendthrift clause is to prohibit an assignment of an interest in an estate, although I haven’t seen a lot of spendthrift clauses in wills, they’re generally in trusts. My research, one of my policy recommendations in the first article is that testators should seriously consider adding them to wills as well. Thank you David, I sure appreciate you helping us learn more about this new development in the trust and estate field.